Iraq lies in what historians and geographers commonly refer to as the Fertile Crescent. Running through the heart of the country are two great rivers (Tigris and Euphrates) that at one time fed and nourished the beginnings of civilization. Historically, Iraq was known in Europe by the Greek eponym ‘Mesopotamia’ (Land between the rivers); after the foundation of the Kingdom of Iraq in 1932, it became known by its ancient endonym ‘Iraq’. Iraq has been home to continuous successive civilizations since the 6th millennium BC. The region between the Tigris and Euphrates rivers is identified as the cradle of civilization and the birthplace of writing and the wheel. Because these two rivers flood periodically, leaving behind fertile soil after the waters recede, farmers were able to produce crops in abundance. This surplus meant that not every person in the society had to devote him or herself to subsistence living, and so industry, government, and religion developed. The first great nation to rise out of the fertile crescent was Sumeria, this in about 4000 B.C. The Sumerians built irrigation canals, and also developed the first known form of writing, known as cuneiform. Beginning with the invasion in 2003, a multinational coalition of forces, mainly American and British, occupied Iraq. 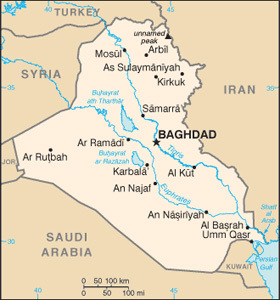 The occupation ended when sovereignty was transferred to the Iraqi Interim Government June 2004. A new Constitution of Iraq has since been approved by referendum and a new Government of Iraq has been elected. Football is the most popular sport in Iraq and has been a considerable uniting factor in Iraq following years of war and unrest. Basketball, swimming, weightlifting, bodybuilding, boxing, kick boxing and tennis are also popular sports. A fascinating (and very British….) video from 1950 about Iraq.